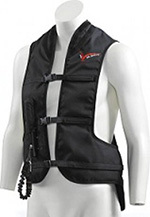 This body protector has been tested at SATRA Technology Centre, Kettering, UK against the manufacturer’s specifications. It conforms to the SATRA technical specification for airbag systems `SATRA M38, July 2012` and EN 16231-2 2003 `motorcyclists protective clothing against mechanical impact – Part 2 Motorcyclists back protectors – Requirements and test methods´. EC Type-Examination certification has been issued by Ricotest, Notified Body number 0498. This body protector is CE marked to denote compliance with the EU Personal Protective Equipment Directive 89/686/EEC. 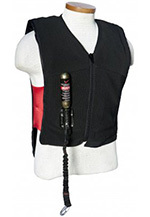 The integrated back protector meets the requirements of European Standard EN 1621-2, which specifies two performance levels as follows: Level 1 protector is impacted at 50 Joules and the mean transmitted force recorded by the apparatus is required to be below 18 kN with no single value above 24 kN. This is the lowest performance class recognised by EN 1621-2-2003. "Seit ich die Pro Air Force Airbag Jacke habe, fühle ich mich bei meinen Rennen viel sicherer. Im Vorfeld haben wir einige Tests mit der Jacke durchgeführt, unter anderem mit einem Vorschlaghammer. Die Wucht hat mich zwar nach hinten gestoßen, aber ansonsten habe ich nichts gefühlt. Mein Fazit: Ich bin hellauf begeistert!"